Sunbird is excited to be participating with our strategic alliance partner Raritan, Inc. at the Defense Intelligence Agency’s 2017 Department of Defense Intelligence Information System Worldwide Conference from August 13-16, 2017 at America’s Center Convention Complex in St. Louis, Missouri. 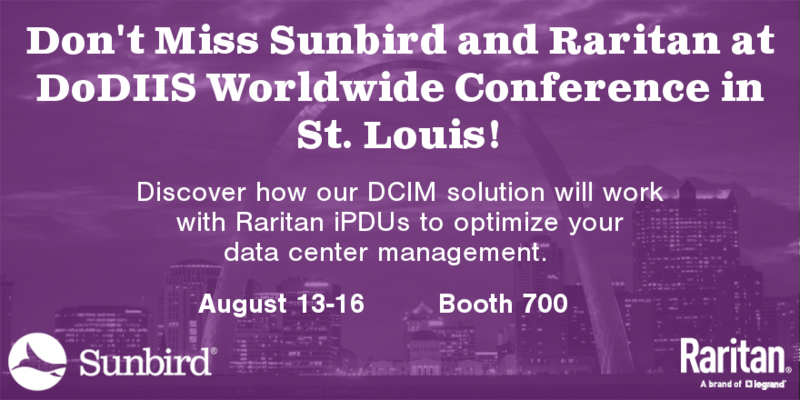 Come talk to us, get a demo of our award-winning Data Center Infrastructure Management (DCIM) solution, and discover how our solution will work with Raritan iPDUs to optimize your data center management. If you're a government or military data center manager or a federal data center professional looking to network with your industry peers as well as senior leaders from the Intelligence Community or Department of Defense, you won't want to miss the DoDIIS Worldwide Conference. While the emphasis of this year’s conference is cybersecurity you can use this opportunity to also understand more about the Data Center Optimization Initiative (DCOI). The DCOI mandates that by 2018, government agencies must use DCIM to develop and report on strategies that consolidate inefficient data center infrastructure, optimize existing facilities, ensure cost savings, and transition to more efficient infrastructures, such as cloud services and interagency shared services. Sunbird’s new DCOI Executive Dashboard allows data center managers to automatically monitor data center assets and measure energy usage, power usage, virtualization efforts, server utilization, and facility utilization thereby meeting DCOI requirements by the end of 2018. Heading to DoDIIS and want to chat one-on-one with a DCIM expert? Our local Sunbird representative will be available for individual meetings. Let us know if you’d like to meet.